Our Bodacious Dog Mom Life: Thank You, David. You Made My Day. A short while ago, he requested our address. He was out and about and purchased something that he wanted to send me. I sent him my address and today, his package was delivered to our doorstep. "I want to thank my friend, David, for the ONLY spider that I deem tolerable. You made my day, sweet friend. This squishy bundle of love will be a year-round decorative piece in our home office. Hugs and love, handsome man!! We love you!" I found the perfect spot on my desk for this adorable spider. It's a reminder that there are good people in this world. Some I know personally. Other's, like David, I've never met in person. 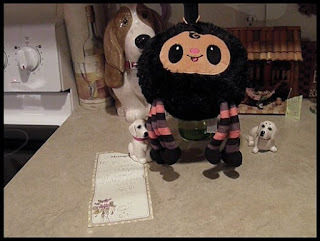 This spider, to everyone else, may just be a simple, plush spider, but to me, it represents so much more. Thank you again, David. You made my day.